With the 2020 presidential election around the corner, both parties appear headed, once again, for a train wreck on health care. While scores of Democrats in Congress and on the presidential campaign trail advocate a single-payer health care system for all Americans immediately, other Democrats embrace the idea of universal coverage as the ultimate goal, but believe it should be achieved incrementally. To some this seems like a repeat ofthe late 1970s when Democrats allowed the perfect to become the enemy of the good, and nothing was done on health care---for another 30 years. Meanwhile the unrelenting opposition of Republicans to the Affordable Care Act suggests that the GOP has no serious interest in offering an affordable health care plan. The voters punished them for it last year. “Those who cannot remember the past are condemned to repeat it,” George Santayana famously said, offering an immutable truth that should be imbedded in the mind of every member of Congress. Health care coverage in the United States has had a compelling but sometimes fraught history that is essential to understand before it is reconsidered. Theodore Roosevelt first proposed national health care in his 1912 platform but he lost that election. Subsequent Democratic presidents including Franklin Roosevelt, Harry Truman and John Kennedy supported the idea but it was Lyndon Johnson who achieved Medicare for seniors with the Medicare Act of 1965. At last every American 65 and over became eligible for federal health insurance regardless of income or medical history; it also included coverage for low-income Americans in the form of Medicaid. It was a landmark achievement, made possible by a unique moment in history and the tenacity of Democratic presidents in keeping the Republican Roosevelt’s 1912 idea alive. The next Democratic president, Jimmy Carter, was in step with his predecessors as he wanted to extend health care to all Americans, but the economic conditions of that time werevery different from 1965. While both houses of Congress were Democratic in 1977-78, inflation was out of control and the economy as a whole was weak, straining the resources of the federal budget. Carter had been a progressive governor of Georgia but a fiscal realist; he believed the country couldn’t afford such an enormous cost at that time without serious economic consequences. While Carter embraced universal coverage as the ultimate goal, he believed it should be achieved incrementally, not only for affordability but also for feasibility. An incremental approach, Carter contended, would aid the federal government’s ability to digest and administer such a huge and complex new system. Additionally, proposing a stepped approach would make it more likely to attract bipartisan support, which he believed was important for its long-term sustainability. Not everyone agreed. Eight years after Johnson’s Great Society was enacted, there were still pent-up demands among congressional Democrats for new federal spending. Senator Edward M. Kennedy (D-MA) was the most vocal spokesman, and he was also, many suspected, planning to challenge Carter for the Democratic presidential nomination in 1980, using national health care as a defining issue. 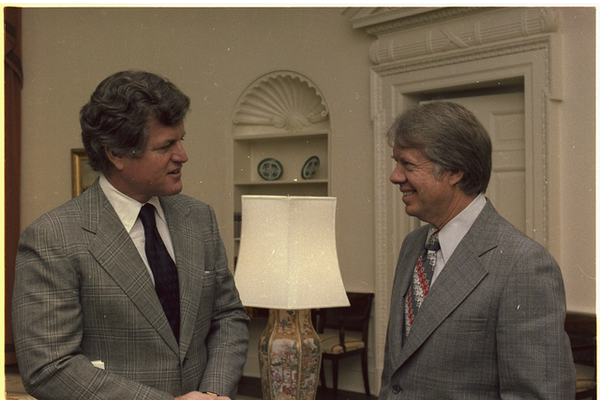 In 1977 Carter’s White House reached out to Kennedy to find a middle ground. It became clear early on that there was a significant difference between the two camps. Over many months, the two parties tried to compromise, but the talks eventually faltered over the specific phasing-in of Carter’s proposal. The unbridgeable gaps were fully revealed at the final meeting between Carter, Kennedy, and their staffs in the Oval Office on July 28, 1978,. When they first appeared, Carter, according to one participant, told Kennedy, “It will doom health care if we split . . . I have no other place to turn if I can’t turn to you . . . I must emphasize fiscal responsibility if we are to have a chance.” Kennedy left the White House and soon announced he couldn’t support whatever the Administration offered on health care and he would write his own comprehensive bill, which he unveiled on May 19, 1979. A month later, Carter delivered a message to Congress calling for catastrophic coverage for all Americans so that families who incurred severe and costly injuries or illnesses would not be financially destroyed. He also called for “comprehensive” coverage of 16 million low income Americans (Medicaid). It was a thoughtful, generous and responsible proposal, and it won significant early support on Capitol Hill, not least because many Democrats saw it as an essential step toward universal coverage. In the previous fall of 1978, Kennedy had addressed the Democrats’ mid-term convention in Kansas City and threw down the gauntlet to Carter: “There are some who say we cannot afford national health insurance . . .But the truth is, we cannot afford not to have national health insurance.” Tensions between the two men, already high, came to a boil when Kennedy formally announced his candidacy for president on Nov. 7, 1979. With no major issues dividing the candidates -- save for the timing but not the goal of universal coverage -- Kennedy’s campaign got off to a faltering start. It was apparent he needed strong support from the more liberal trade unionsand some unions did sign on with Kennedy, including the United auto Workers, which had been a long-time supporter of national health care. The UAW’s leadership pledged it would use its clout to see the plan enacted. Even after Carter captured sufficient delegates to win the nomination following a brutal series of primaries, the UAW would notback down from its all-or-nothing position. Neither would Kennedy. The hard-fought contest took its toll on both candidates and, tragically, on the issue of health care. In short, the dynamics of the 1980 primary campaign inevitably precluded the kind of legislative process that might have enabled universal catastrophic coverage to become law. An important opportunity was lost; the American people would have to wait another 30 yearsfor major health care reform. It finally arrived in 2009 when President Barack Obama unveiled the Affordable Care Act as his highest legislative priority. The ACA or, as it became known, Obamacare, bore a striking resemblance to Carter’s proposal three decades before. New to the presidency, Obama’s leadership was sometimes hesitant and he failed to articulate a strong and consistent public case for his proposal, an omission that made passage more difficult. At a joint session of Congress in September 2009, the president read an endorsement from Senator Kennedy, written before he had died the month before. Obama rallied the congressional Democrats and, with the indispensable help of Speaker Nancy Pelosi, ACA finally became law in 2010. It was an historic achievement, representing the most significant regulatory overhaul and expansion of coverage since 1965. With few Republicans supporting Obamacare, GOP leaders made its repeal their rallying cry for nearly a decade. Yet, they failed even when Republicans controlled both houses of Congress and the White House. With Democrats now in control of the House of Representatives, the ACA finally appears secure--except that President Trump’s Justice Department is trying to overturn the ACA altogether. Republican control of the Senate and White House makes it a prohibitive time to attempt any major expansion of health care. There is nonetheless an opportunity for Democrats -- and hopefully Republicans -- to prepare for the future by working together during the next two years to fix and strengthen the ACA so that it actually delivers the care it is meant to deliver. They should also come together to significantly reduce the cost of medications, for which there is an undeniable bipartisan public mandate. Who knows where this could lead? If led by serious people on both sides, it could yield yet more success stories like criminal justice reform and conservation of public lands. Whatever it is, it’s better than polarized stalemate. Thus, if the ultimate goal is to expand affordable health care to every American, history offers important lessons. It tells Democrats that in the next two years they must be politically savvy, and in some instances, uncharacteristically restrained, if they want to be poised to offer a viable form of expanded health care in 2021. They must be honest that 2021 is the first time a plan realistically can be considered. Before then, they must avoid the public perception of “over-reach,” a political deadly sin that costs politicians who appear to offer grand proposals that are hugely expensive, complex and unwieldy. “Medicare for All” comes to mind as something many people already see as over-reach. Voters have finely attuned antennae, and most can tell when they’re being played by a slogan. On the other hand, Americans will respond favorably to reasoned proposals even for aspirational goals,as they did in 2018. They will do so again if a plan is couched in language they can understand, such as supporting a proposal for 2020 that offers “affordable health care for every American regardless of income or existing conditions.” At the same time, liberal Democrats should resist the siren song of ideological purity and embrace insteada pragmatism that will assure ultimate success. The run-up to 2020 will be better than the 1970s unless Democrats take their eye off the ultimate goal and again allow a deep division within the party to preclude the outcome most Americans seek. As for Republicans, history tells them that if they want to help shape America’s health care of the future, they should 1) accept the legitimacy, if not every detail, of the ACA,which is, after all, a direct philosophical descendant of the thinking of the conservative Heritage Foundation, as well as the first cousin of Republican governor Mitt Romney’s plan for Massachusetts, and 2) abandon their blind opposition to any expansion of health care. They should engage in a constructive and serious conversation with Democrats so that by 2021 we will have something approaching a national consensus on how to care for our health.